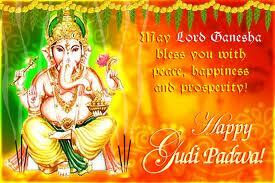 Gudi Padwa as the name suggest is a start and it is the first day of the year. Gudi Padwa is celebrated during Chaitra Sukla Paksha Padyami or First day of the waxing phase of the moon in the month of Chaitra as per lunar calendar. 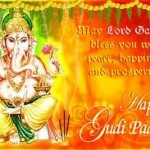 This year Gudi Padwa will be celebrated on Thursday, 31st March, 2033. Gudi Padwa is the start of new year for Maharshtrians. It is celebrated with lot of joy. On Gudi Padwa, a Gudi is a common sight in the house holds of Maharashtra. A Gudi is prepared by tying a bright gree on yellow cloth with brocade to a long bamboo stick,along with sugar crystal(gaathi), Mango twig, neem leaves and a garland of red flowers. Over all this a copper or silver pot is placed in invereted position. A Gudi is normally hoisted outside the house or terrace or from a window for all to see. People normally wear new clothes on Gudi Padwa and greet each other. It is also a tradition to start the day eating bitter Neem leaves along with Jaggery and Tamarind on Gudi Padwa. Shrikand and Puri or Puran Poli is a prepared on Gudi Padwa. Gudi Padwa is celebrated in different parts of the country with different names like Ugadi, Cheti Chand, Thappan etc.